Sleep apnea could be affecting your life and you may not even realize it! Sleep apnea is a condition where you periodically stop breathing during sleep and your body wakes you up to restart breathing. Since these episodes are so brief, people with the condition generally don’t remember them. But the condition can have a huge impact on your life, causing poor sleep quality, daytime tiredness, and additional, more serious health problems. Our dentists have experience with sleep apnea in Moorpark, CA, and can diagnose and treat this condition. If you experience any of the above, you may be suffering from sleep apnea. There are two main types of sleep apnea–Obstructive Sleep Apnea (OSA) and Central Sleep Apnea (CSA). Obstructive Sleep Apnea is caused by a blockage in the throat, usually the soft palate collapsing into the throat. Risk factors for obstructive sleep apnea include obesity, smoking, sedative use, a short neck, and genetics. Central Sleep Apnea is caused by a dysfunction of the central nervous system in which the breathing mechanism doesn’t receive the proper signals from the brain and stops working. Some people also experience a combination of these two types of sleep apnea. Are There Complications from Sleep Apnea? Sleep apnea is dangerous. If left untreated, it can cause heart problems, stroke, and high blood pressure, not to mention the negative effects of sleep deprivation on your mind and productivity. The first line of treatment is to reduce risk factors. It’s recommended to lose weight, quit smoking, drinking, and discontinue the use of sedatives. 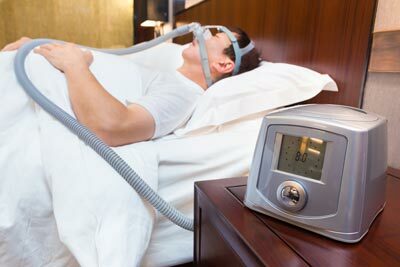 Additionally, there are devices specifically designed to improve breathing during sleep, such as CPAP machines. These machines push pressurized air into the throat to keep the airway open and can greatly benefit sleep apnea patients. Sleep apnea can also affect your appearance! Dr. Potts has been featured in an article regarding sleep apnea in Moorpark, CA, and its effect on your appearance – click here to learn more. Snoring is a fairly common issue people have and can be the result of several factors. Typically, snoring is caused by the relaxing of the muscles and soft tissues in the throat and mouth, making the air passage smaller. The decrease in space through the airway makes it harder for each breath to get through, and when it does get through, the breath moves over the soft tissues in the mouth and throat, causing a vibration that results in the snoring sound. If you snore at night, then a mandibular advancement device (MAD) may represent a solution and a provide you with a better night’s sleep! The MAD is a specially-designed dental device that gently helps keep the lower jaw (or mandible) in a forward position. This increases the space between the airway passage and helps you breathe better so you can get a full, quiet night’s sleep. Some devices also stop the tongue from falling back over your windpipe. Our dentist will fit these special appliances to meet your individual condition. Call today to learn more! All our treatments are backed by a 5-year Guarantee as long as you follow our dentist’s aftercare recommendations. 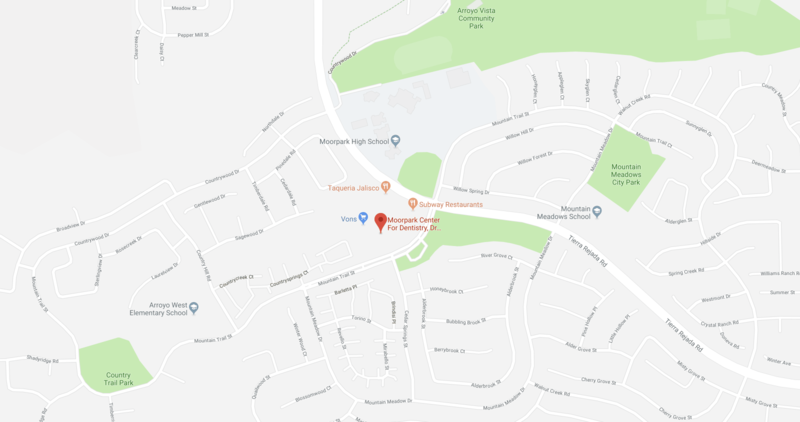 We proudly offer a 100% Satisfaction Guarantee- if you are unhappy with the care you receive from our experienced team, simply let us know and we’ll do what it takes to make it right – that’s our Moorpark Center for Dentistry promise to you! Plus, with our convenient appointment times, we guarantee you’ll never have to miss work or school for an appointment with us! Contact Our Office to Learn About Treatment for Sleep Apnea in Moorpark, CA! To learn more about treatment for sleep apnea or snoring from Moorpark Center for Dentistry, contact our friendly office today! Simply call 805.243.3999 or click here to schedule your complimentary Moorpark Center for Dentistry New Patient Exam. Your new patient appointment includes a review of your dental and medical history forms, digital x-rays, and a consultation with Dr. Potts – for FREE! Plus, you can add an oral cancer screening and teeth cleaning for just $97! Call today – we look forward to helping you get a peaceful night’s sleep and to improving your health!